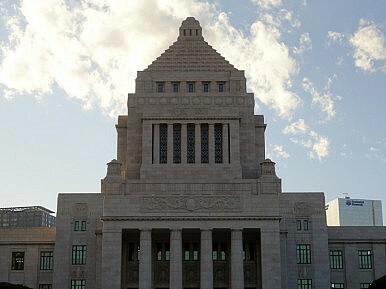 Two new bills could revolutionize the Japanese military’s ability to fight abroad. In a move that signals an expansion of the role of Japan’s Self-Defense Forces (SDF) overseas, Prime Minister Shinzo Abe’s cabinet adopted two bills on Thursday that would expand the scope of Japanese overseas military operations with foreign forces, Japan Times reports. The two bills affect SDF operations in different ways. The first amends a series of ten security laws that would effectively remove restrictions on Japan’s ability to exercise the right of collective self-defense. Last year, the Abe cabinet reinterpreted Article 9 of Japan’s constitution to allow for this right. Under the reinterpretation and under this new bill, Japanese troops would be permitted to participate in a campaign under the justification of collective self-defense either when Japan’s survival is at stake, or when a close ally suffers an armed attack and there are “no other appropriate means” to safeguard Japanese interests and citizens. The second bill streamlines the Japanese government’s ability to dispatch the SDF abroad to provide logistical support for an allied foreign force, removing the cumbersome necessity of having the Diet pass a unique, temporary law for each such operation. In recent years, Japan’s SDF have gone to Iraq and Afghanistan to engage in such operations with legislative backing. The second bill does contain a provision that notes that the government would still need the approval of the legislature before proceeding with an SDF deployment abroad. The cabinet’s approval of these two bills comes shortly after the United States and Japan finalized a new set of defense cooperation guidelines during Abe’s visit to the United States in April. The guidelines emphasize an increasingly global role for the U.S.-Japan alliance and are in line with Abe’s vision of a more ‘normal’ Japan, acting as a “proactive pacifist” state in Asia. The bills will add legal heft to last year’s constitutional reinterpretation. Without the support of these bills in the Diet, the Abe government will remain constrained in its ability to deploy the SDF abroad.